Comics have always had a bit of a rebellious streak. Whether it was the myriad of ways publishers conceived to get around the Comics Code, the cultural criticism found in some of the medium’s most acclaimed books, or even the fact that superheroes operate outside the law, comic books have never shied away from breaking the rules and have always been a voice against oppression and injustice. SCARLET, the popular Jinxworld series from Brian Michael Bendis and Alex Maleev, fully embraces this tradition. 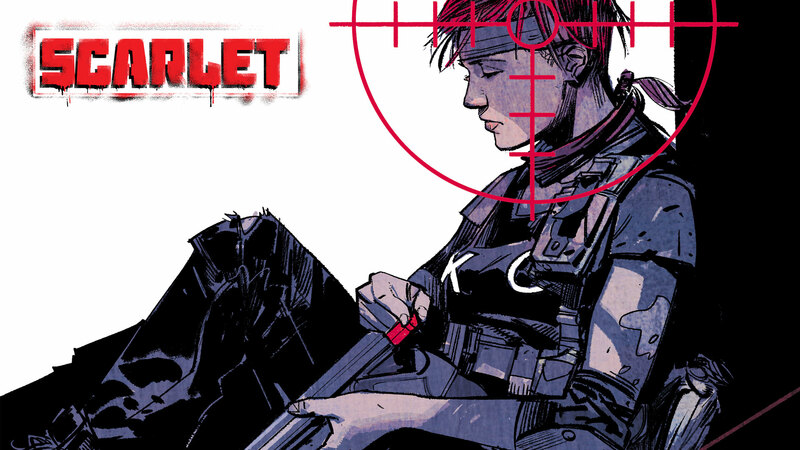 With its story of a new American Revolution and its fourth-wall breaking protagonist, Scarlet has never been a series about doing what you’re supposed to, a tradition that continues today as the book returns with a new issue #1 and a new publishing partner. Scarlet is technically the second Jinxworld comic to be released since Bendis became exclusive to DC, but it’s the first Jinxworld book that had life before DC. Today’s SCARLET #1 is technically the eleventh issue of the series. There’s no reason that you can’t start with it, but you might want to know a bit more about this timely piece of revolutionary fiction before you do. Considering today’s world of mass protests and resistance, it’s not hard to imagine a story like Bendis and Maleev’s actually coming to pass, and interestingly enough, Scarlet was partially inspired by a real-life incident, as well as the famously progressive city that Bendis calls home. “Right now, we’re a Portland book,” he shares. “It takes place here. And why it takes place here is that in Portland, we care. I was startled by how often the city would be shut down by protests into the deep night. I’m talking about pre-Obama, and during Obama, and now. People have now seen headlines. It was the idea that if the new American Revolution ever happened, and we woke up and learned that it started here in Portland, we wouldn’t be surprised. The series first debuted eight years ago, in 2010, but it’s become more relevant with time, something the creative team is very aware of. Scarlet Rue is a fictional heroine who isn’t based on anyone in particular, but considering how much anger can be found in modern day society, it’s not hard to imagine someone a lot like her emerging in real life. But Scarlet isn’t just forward thinking in its story—it’s entire presentation aims to move the comics bar forward. Maleev’s color palette is muddied and dim, fitting for its battlefield setting. However, he uses brighter color to really add impact to important characters or moments, whether it’s an explosion, a spurt of blood or Scarlet’s crimson hair. Even more noteworthy, however, is the way that Scarlet breaks the fourth wall and talks directly to the reader (indicated by square word balloons and italicized text). While other comics that break the fourth wall usually use the technique for comedy, Bendis and Maleev rely on it to really give the reader an understanding of who Scarlet is and why she’s doing everything she’s doing. You get to know her really well, really quickly. It’s something that Bendis had been interested in and experimenting with for a while, ever since he saw a similar technique used extremely effectively in an Aaron Sorkin play. However, to use it in a superhero comic didn’t feel right. In short, Bendis and Maleev have created one of comics’ most engaging protagonists and set her in an entirely gripping—and all-too-plausible—scenario. Scarlet asks the age-old question of what happens when someone finally gets pushed too far, only to take that person in a surprising direction. For readers who might be tired of playing by the rules, both in life and in comics, it offers much to consider. SCARLET #1 by Brian Michael Bendis and Alex Maleev is now available in print and as a digital download. scarlet, Jinxworld, Brian Michael Bendis, alex maleev, brian michael bendis interview, scarlet interview, portland, american revolution, social issues, Thriller, suspense, war comics, creator owned comics, who is scarlet?